There is a funny-looking creature that lives at the bottom of the ocean. It’s an animal, but the name of it is “Sea Cucumber.” The name is misleading, however. It tastes nothing like a cucumber, which is too bad, because I like cucumbers. I do not like the taste of 3-year-old rubber bands, which is too bad, because this is what sea cucumbers actually taste like. There is a belief among the Chinese people that eating this poor disgusting animal is healthy for you. I of course find that very hard to believe, but nevertheless it’s unfortunate for the little bugs, because that makes them very popular among certain segments of the Chinese population. 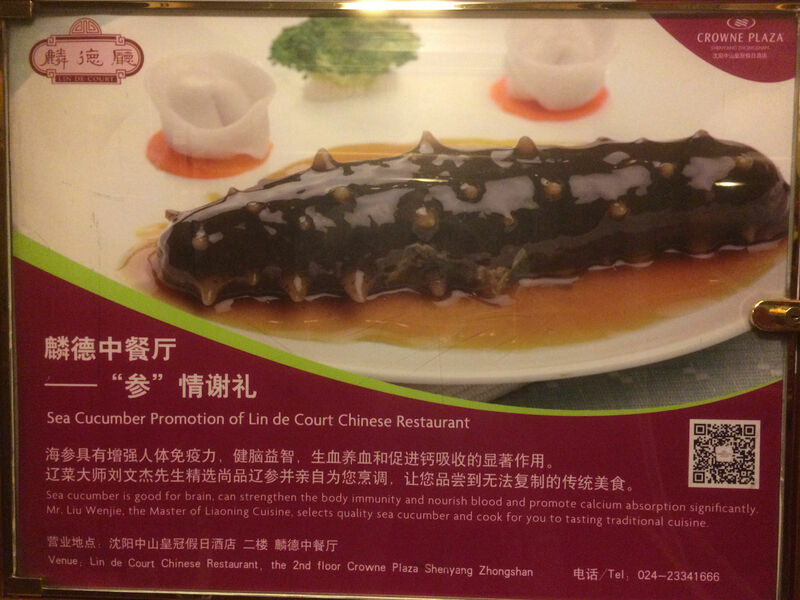 The hotel where I live is having some sort of sea cucumber festival this month. Here’s the promotion picture that is in the elevator. I will have to look at this for the next month. Does this look appealing to you? Me neither.